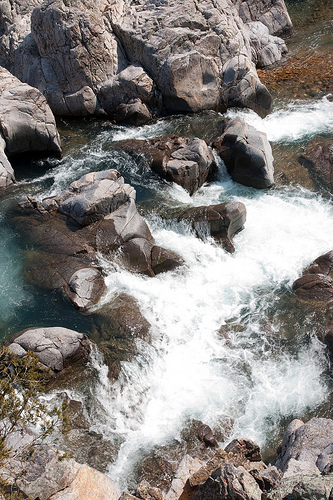 Water flows through shut-ins at Johnson's Shut-Ins State Park. Last summer was a dream come true; I was part of the State Parks Youth Corps (SPYC), which used federal stimulus money to put about 1,000 youths to work in Missouri’s fantastic state parks. Instead of revitalizing the park system physically like most of SPYC, I was one of 11 journalism students who spent the summer producing photo and video content of our state parks. I spent the summer traveling the state to many of our parks and historic sites to videotape, as well as photograph, the state’s natural and cultural wonders. But I’d have to say that of all the parks and sites I visited, Johnson’s Shut-Ins impressed me the most. Missouri’s summers are hot, especially in Southern Missouri, but Johnson’s Shut-Ins (JSI) is the perfect answer. The park’s name sake, the shut-ins, is one of the nation’s top-ranked natural water parks, on par with anything we humans could fathom. For millennia, the water of the Black River cut through the rhylite and granite rock of the ancient caldera that formed the St. Francois Mountains. That water formed the “shut-ins”—an old Appalachian term for a gorge—by eroding softer stone away from smooth spires, slopes and craters. Now, the water breaks over these complex rock formations, leaving secluded little pools, water slides and deep holes perfect for that giant cannon ball. And after a long day of shooting video on the trail, there was nothing quite like relaxing in one of those little dug-out pools and receiving the best massage I’ve ever had under a waterfall. All thanks to mother nature herself. But the shut-ins weren’t the only thing that drew me to JSI. This was the first year that JSI had been completely open after a neighboring water reservoir failed in December of 2005. That levee failure sent a tremendous wave through the park in something like 14 minutes. So, the new campground is completely state-of-the-art (the store has Wi-Fi). The new Black River Cultural Center is amazing and the day use areas are perfect. But I’m more of a nature guy myself, and that is where JSI’s trails come in. As a photographer, I’m a sucker for large landscape views, and JSI delivers. The park is huge (8,500 acres) and hosts on its mountain sides these magnificent glades. Giant outcroppings of red and pink granite abound and here the sun light transforms into those soft warm colors of sunset even in the middle of the day. There is much biodiversity in terms of differing habitats, from pine or hardwood forest to fens. The park hosts a large section of the Ozark Trail and has new trails, for instance, the one that shows off some of the glades right above the shut-ins. 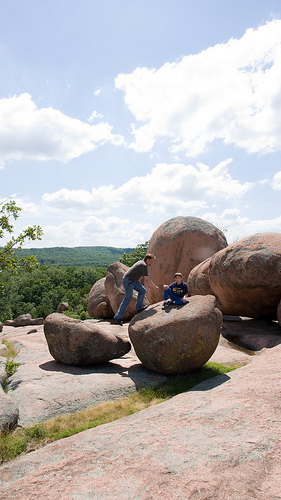 See the massive formations at Elephant Rocks State Park. • St. Joe State Park, the best off-road-vehicle fun to be found in Missouri (and most neighboring states as well). So take it from a guy who had the privileged of traveling to many of Missouri’s premiere state parks: make JSI your home base for your next vacation. You’ll keep coming back. I know I will. Written by James Saracini, a Moniteau County native and 2010 graduate of the University of Missouri School of Journalism.